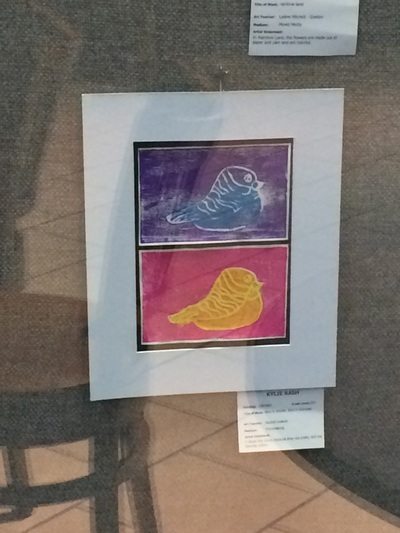 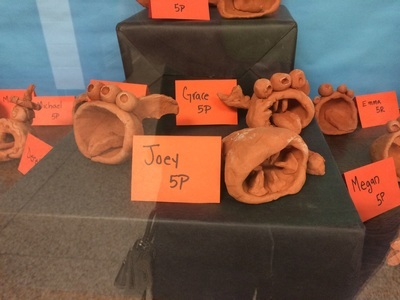 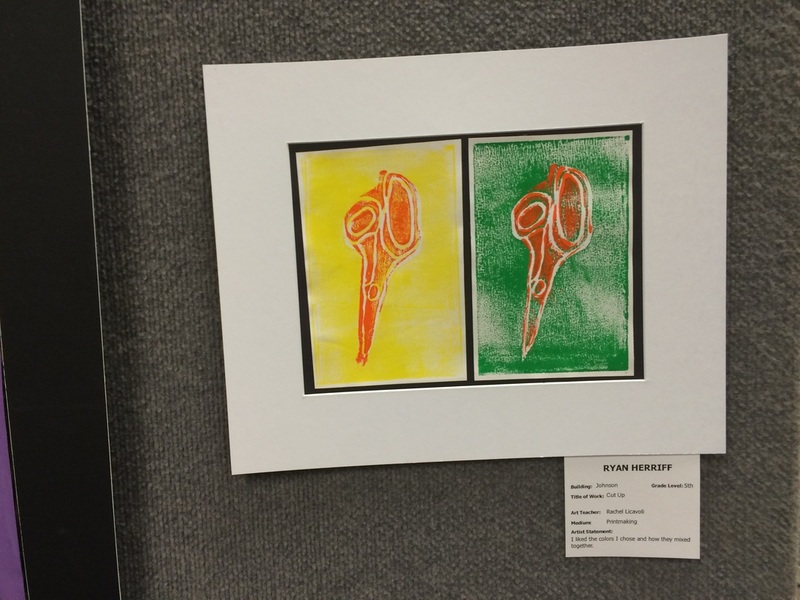 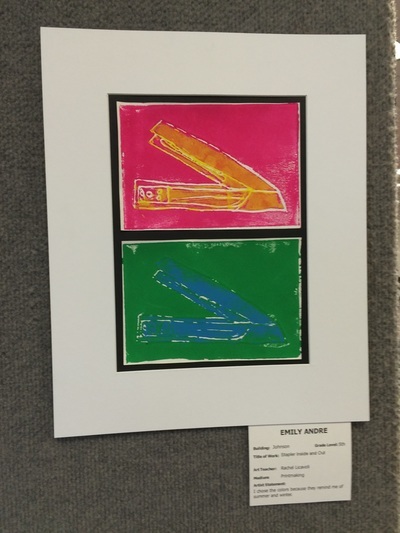 Pictures from our 2014-2015 Johnson Art Show. 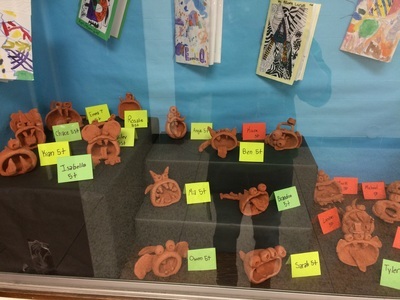 Thank you to my parent volunteers, family, friends and students who helped set up this wonderful art show! There was a choir concert during the show as well as our annual Ice Cream Social. I hope everyone had a chance to come out to see all the art and appreciate their child's many creative talents! 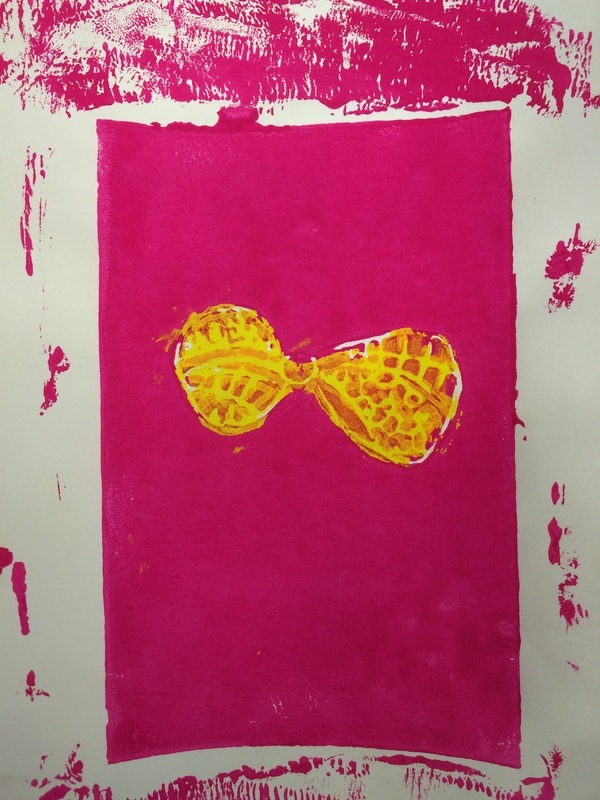 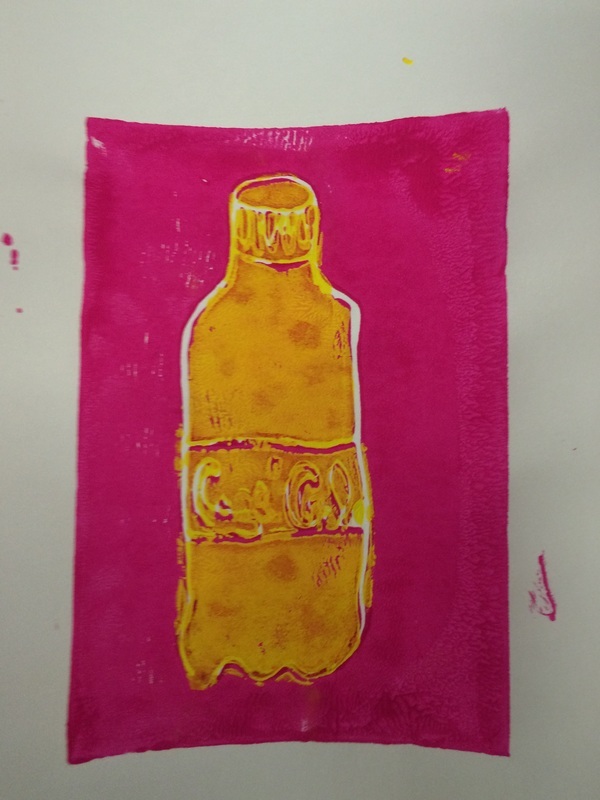 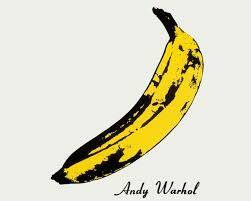 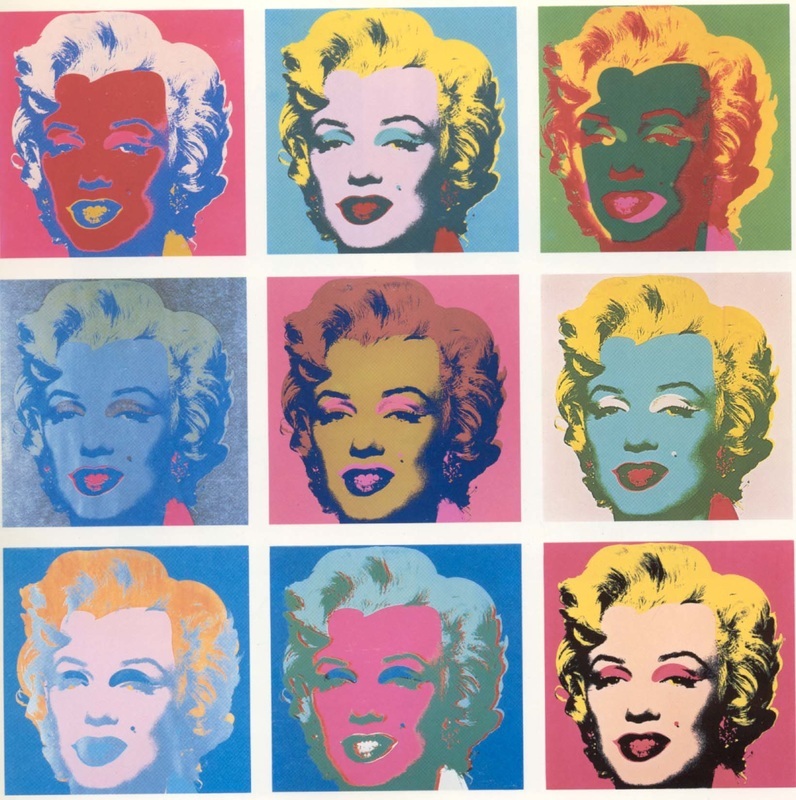 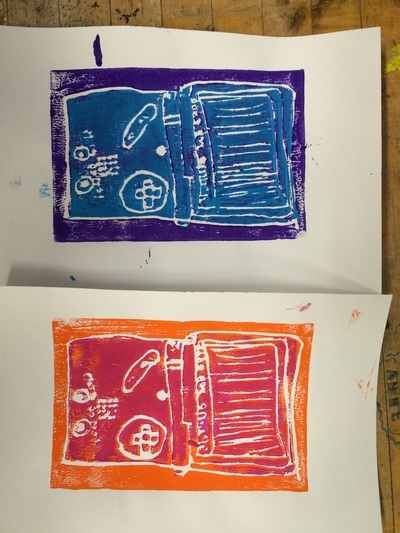 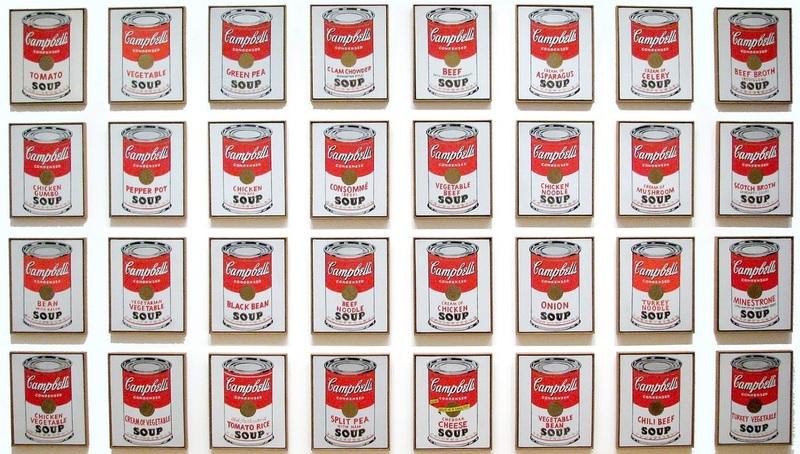 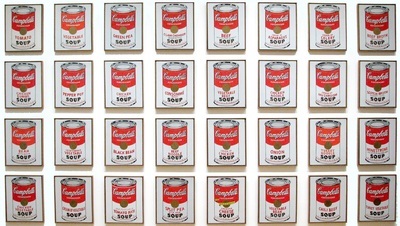 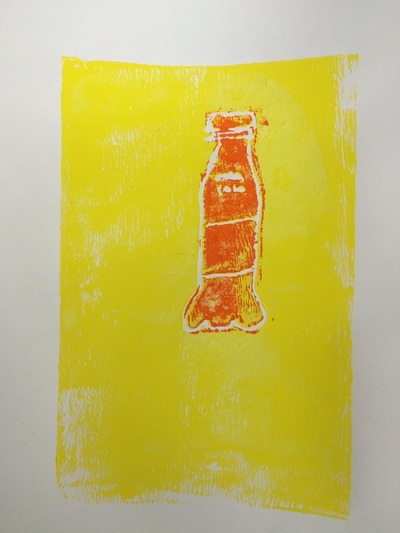 In order to more closely resemble the printing style of Andy Warhol, we used a method called reduction printing. 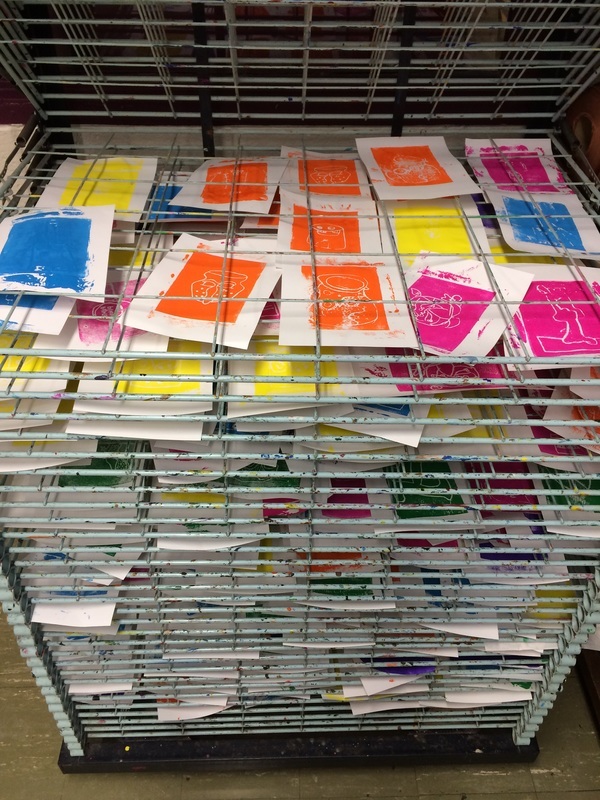 This is where a plate is changed in between printings. 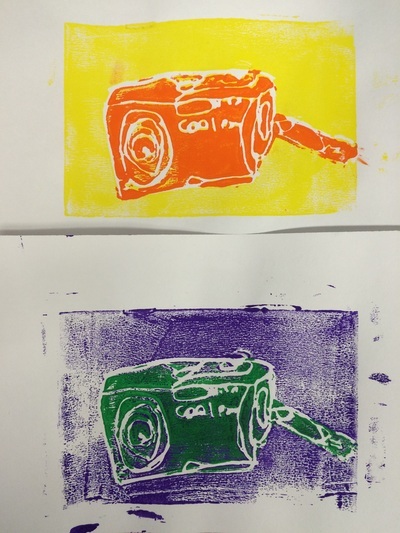 This allows for colors to be layered on one print and to create focus in a picture. 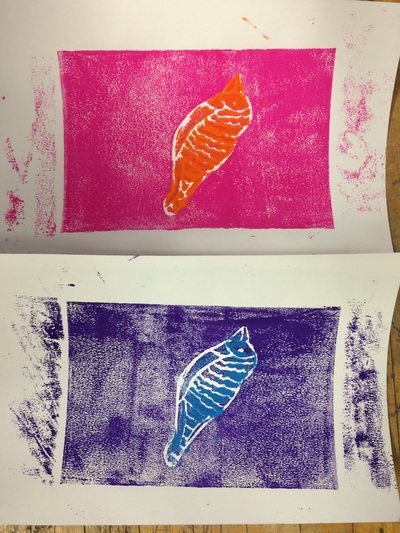 We did only one reduction, but the results were very striking. 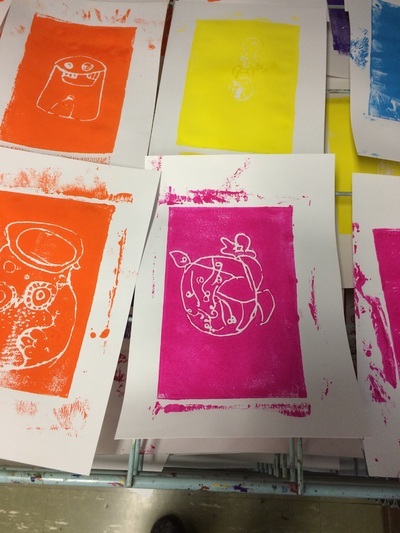 Once the first 8 prints were complete, students used scissors to carefully cut their printing plate. 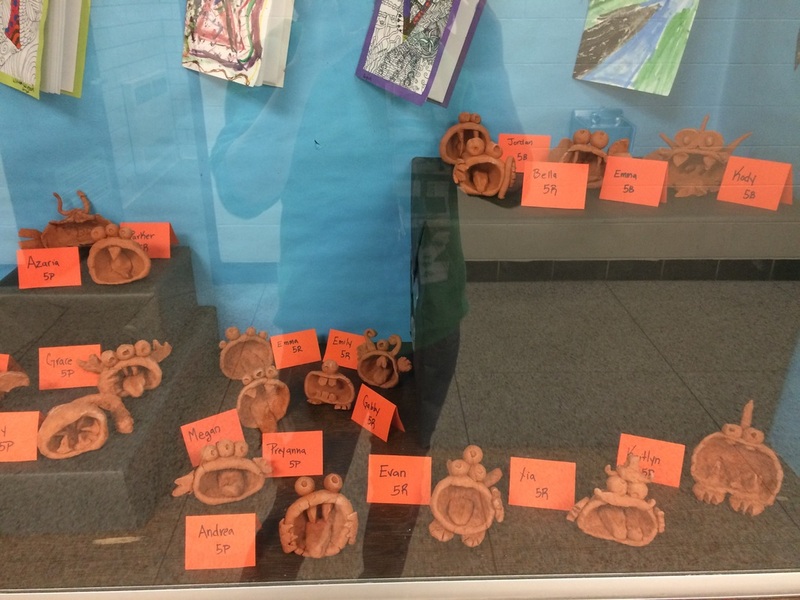 They either cut directly on the contour line of their object or left some room around it if their object was very intricate or small. 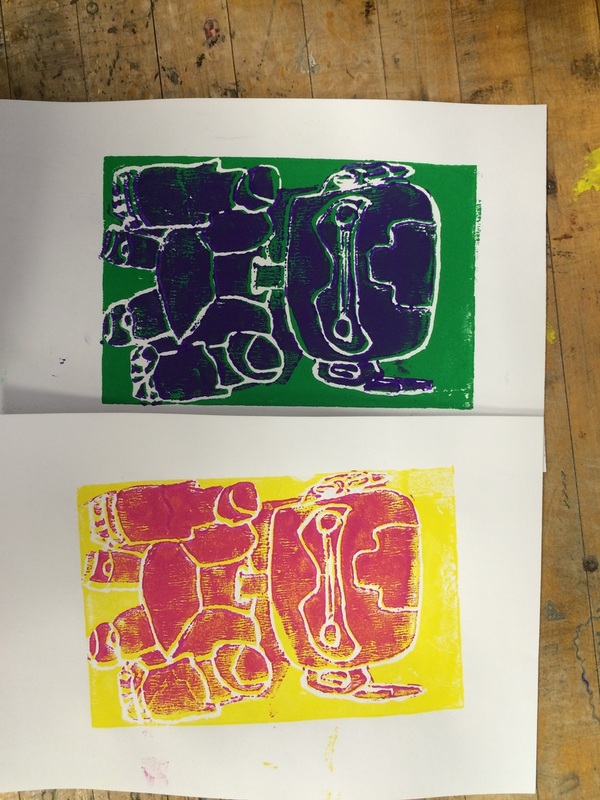 Once the plate was reduced, they started their second round of printing. 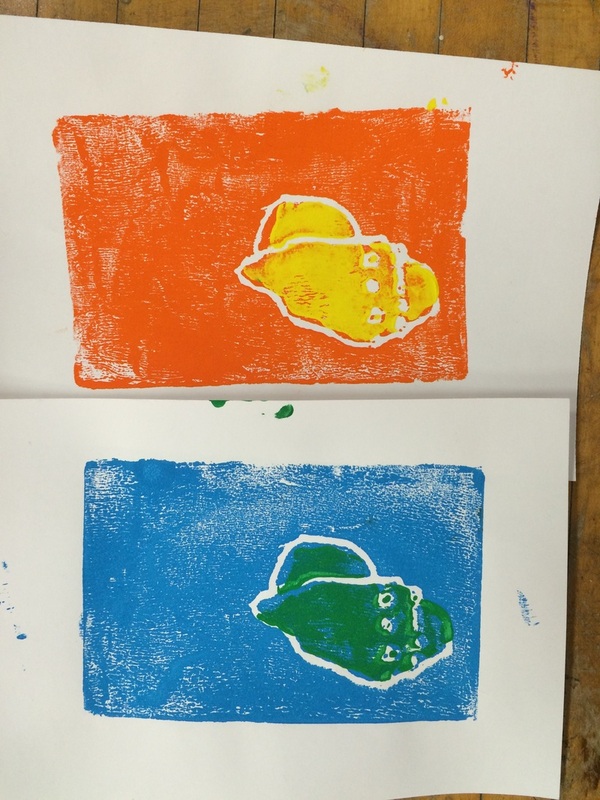 They layered a new warm color on their warm color prints and a new cool color on their cool color prints. 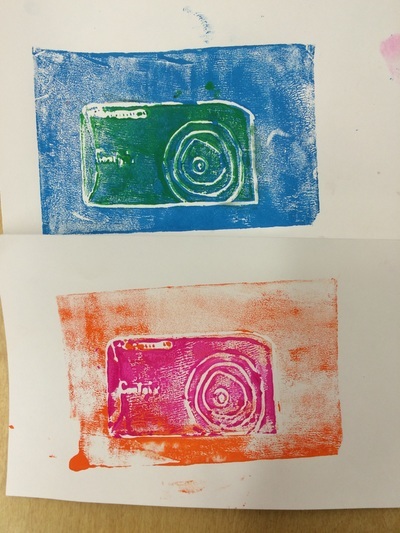 When all the prints were complete, students chose whether to have a two or four pane piece. 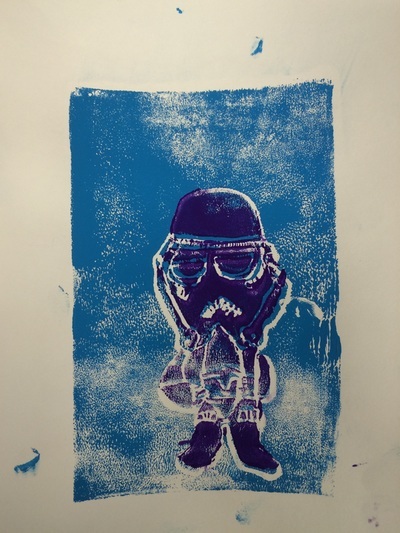 The prints were cut and matted onto black paper. 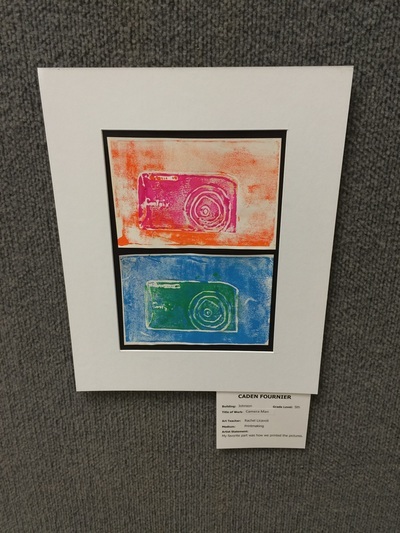 The four shown below were matted with white to be hung in the Annual Fine Arts Festival held at the Livonia Civic Library. Congratulations to the students below! 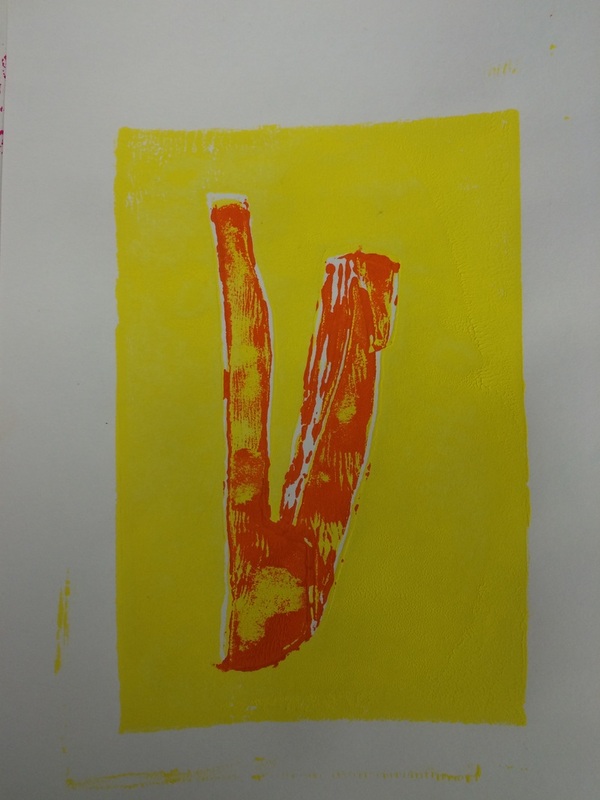 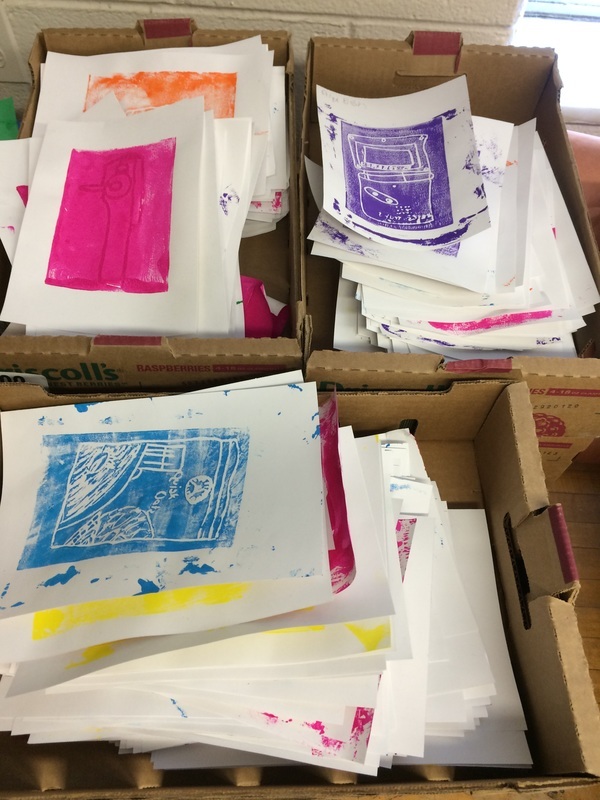 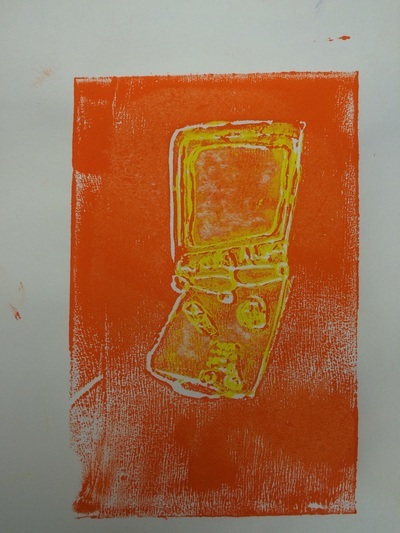 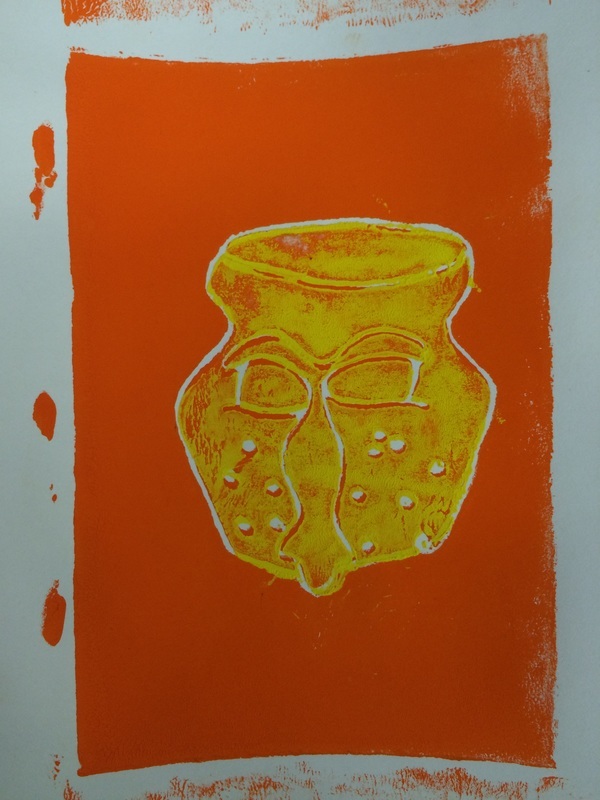 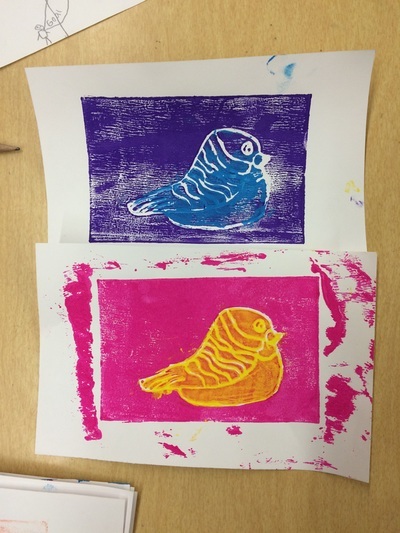 Once all of the printing plates were made, students learned how to use a brayer to spread paint on their plate and how to pull a print. 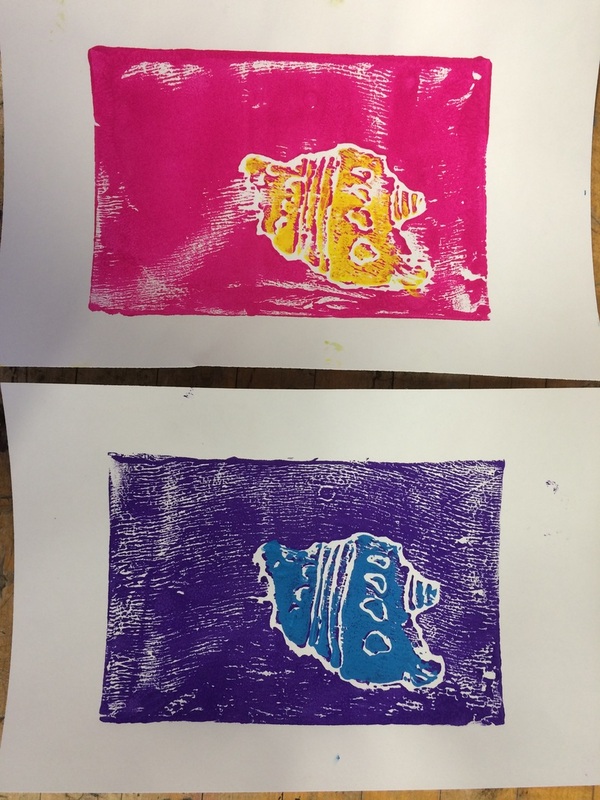 I explained that if the paint is even on the plate, it will be even on the print, but if they left globs on the plate, their print would have that glob as well. Students spent two days printing with this plate. 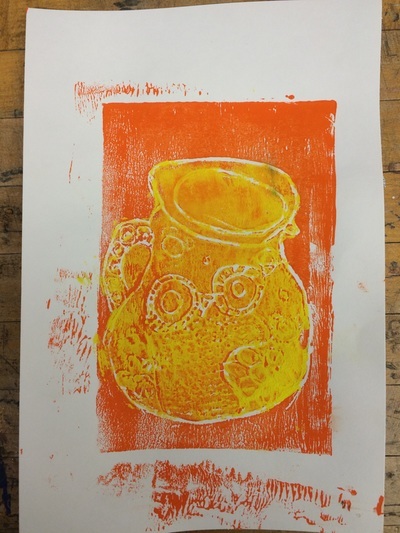 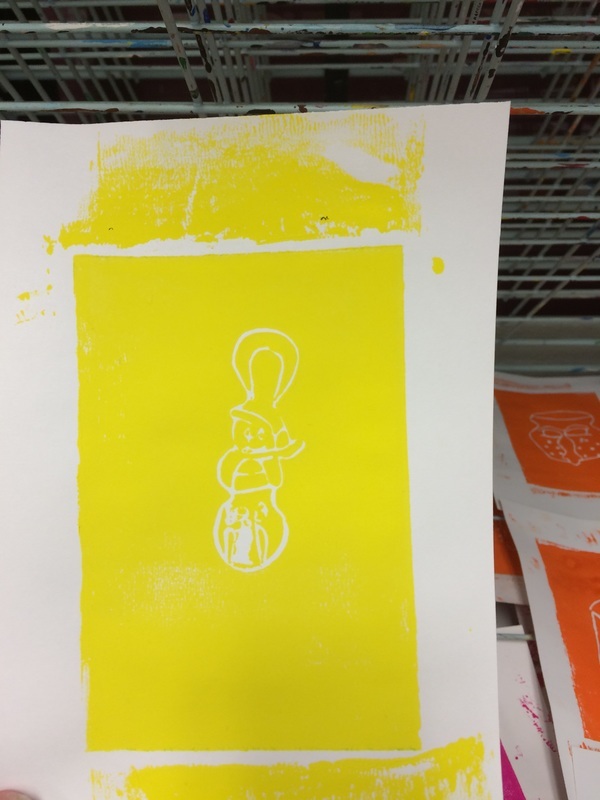 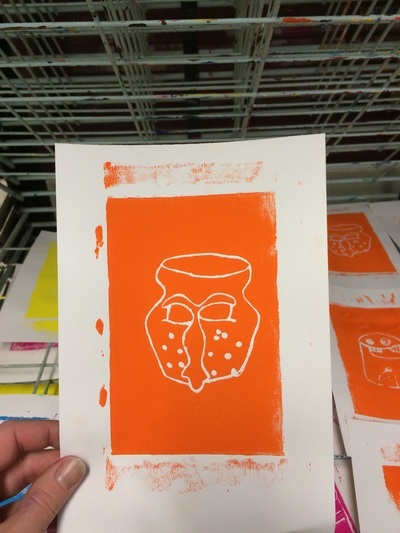 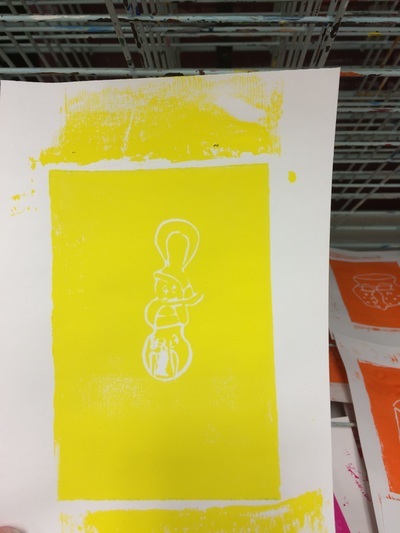 They chose a cool color and a warm color to use for their first 8 prints. 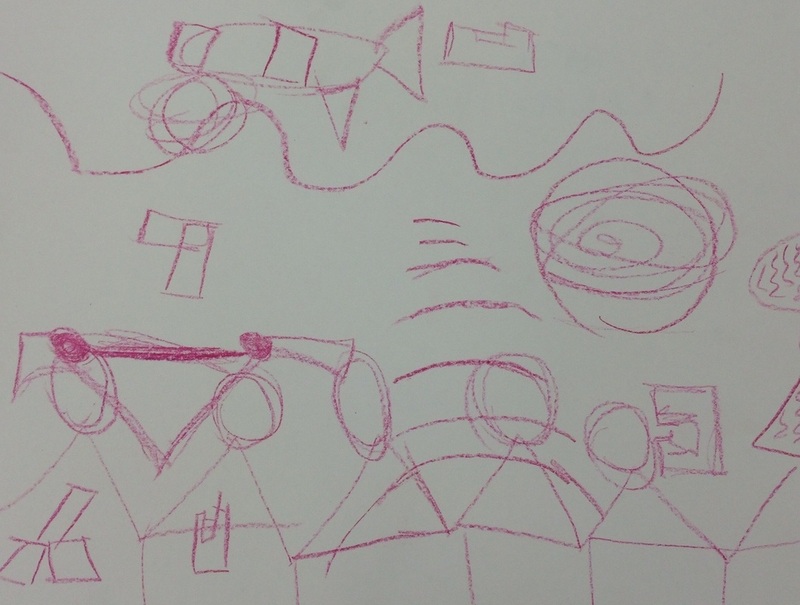 To start our new project, we talked about a different style of drawing, that of doing contour line drawings. We practiced doing contour drawings by picking an object and creating a blind contour (don't look at the paper), modified contour (if you look at the paper, your pencil has to stop) and regular contour drawings (can look back and forth). 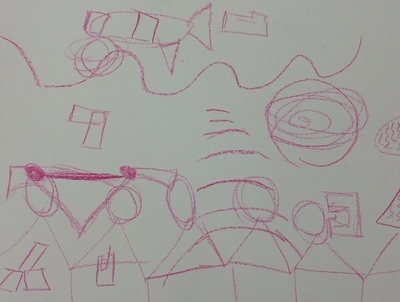 We did this so that students could start to learn how to draw what they see rather than what they think they know already. 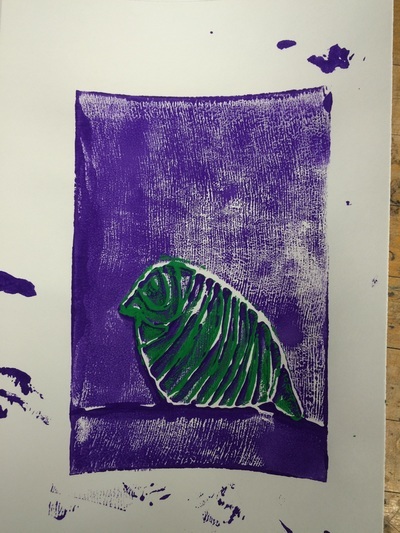 By doing a blind contour drawing first, the student is forced to stare at the object and notice things about it they would not have noticed before. 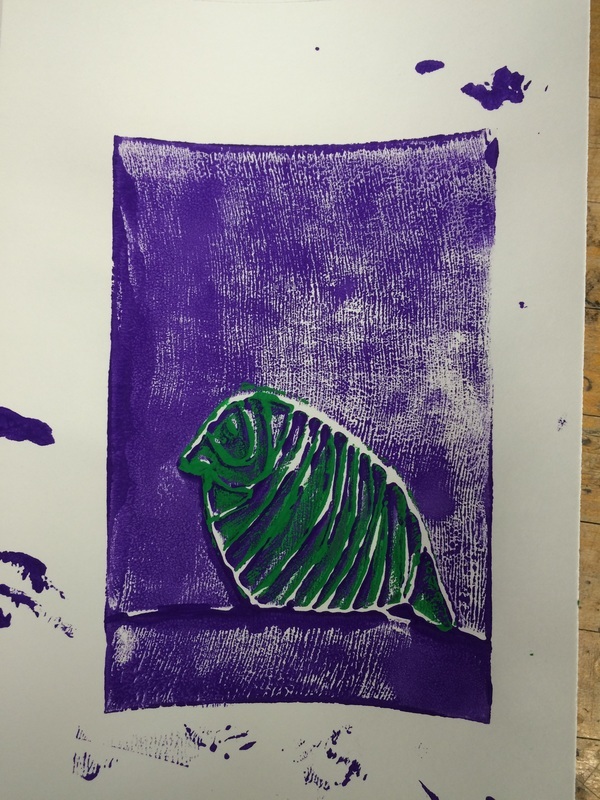 The modified contour drawing helps bridge the gap and allows students to put these new details into their drawing, but still forces them to focus on the details. 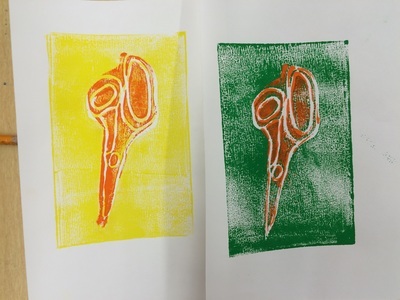 By the time they got to the regular drawing, students knew the object very well and could show all the details they noticed in the final drawing. 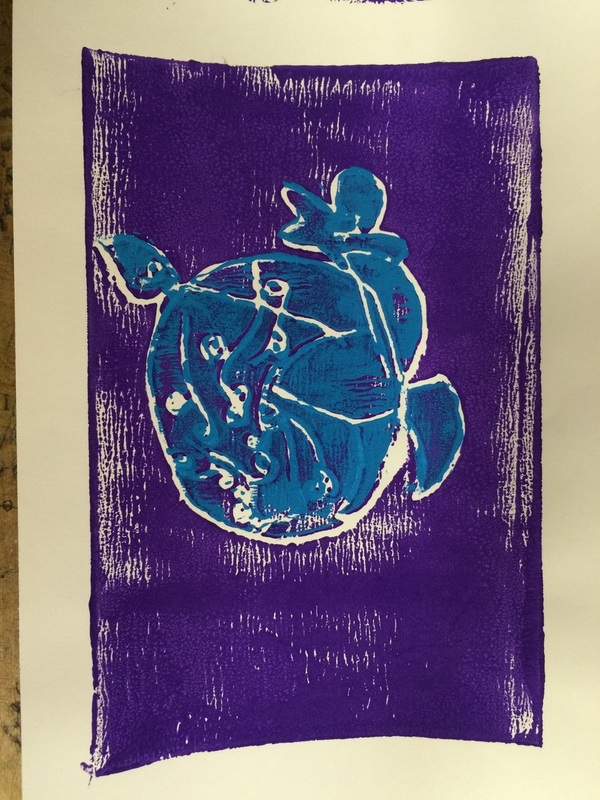 Once the students all had a good, detailed regular contour drawing of their chosen object, the traced the picture onto a foam printing plate. 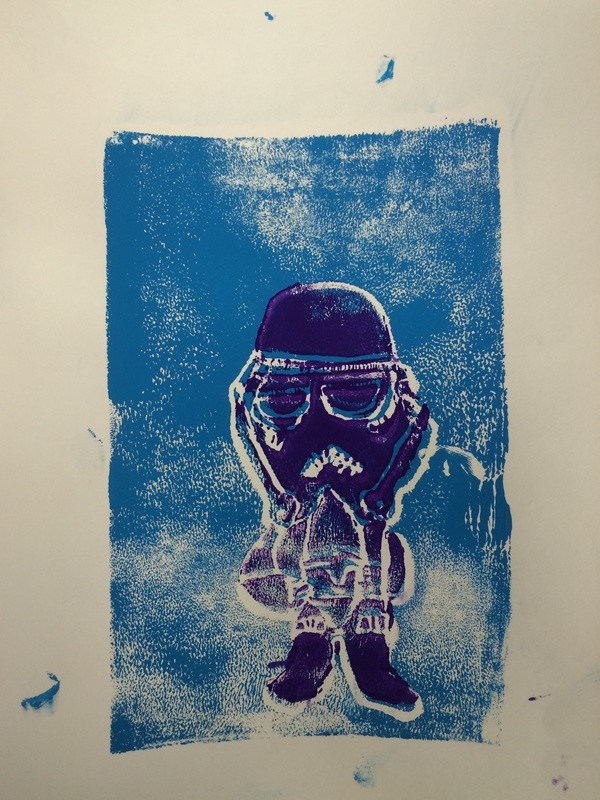 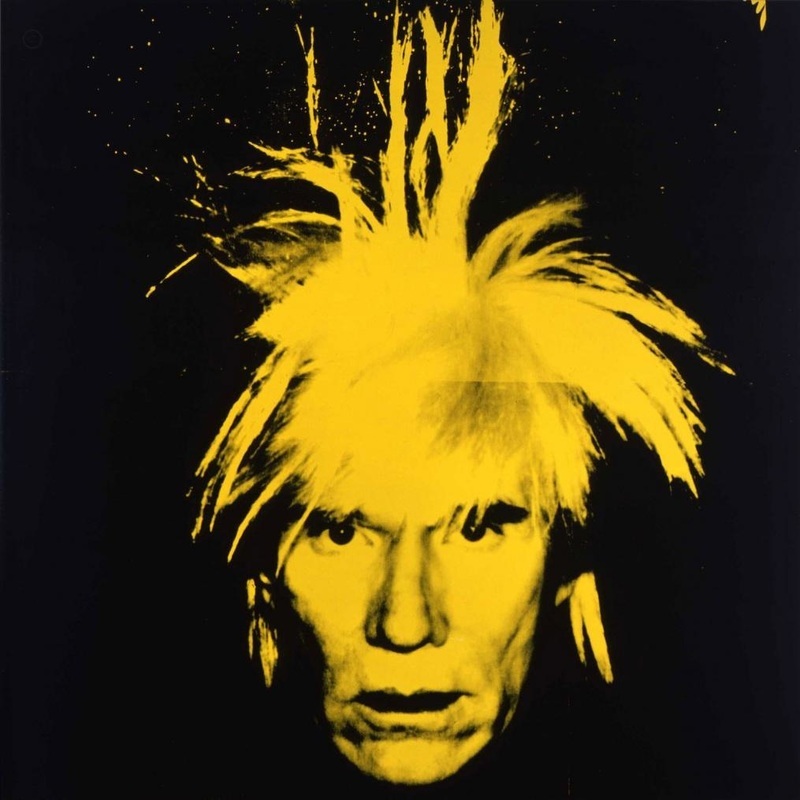 Before we started our printing, we looked at the work of Andy Warhol and talked about his use of printmaking and his inclusion of "mistakes" in his final (very famous) prints. 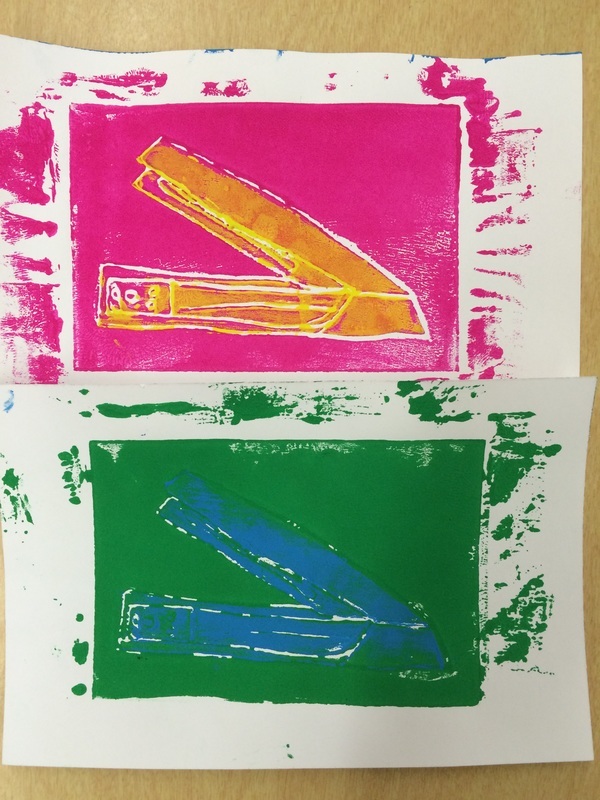 This week we talked about the Color Wheel. We did a whole class on what it was, how it was used and addressed several different color families such as Analogous, Complimentary, Warm, Cool, Primary and Secondary. Students worked in tables to fill in a color wheel sheet and then were introduced to the second part of the assignment. 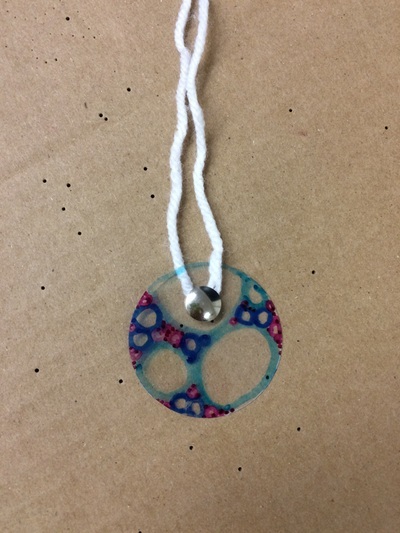 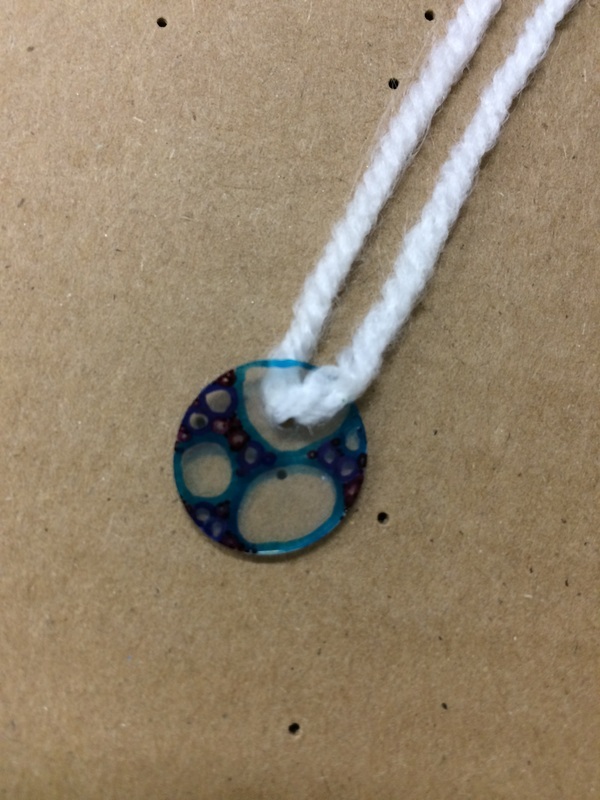 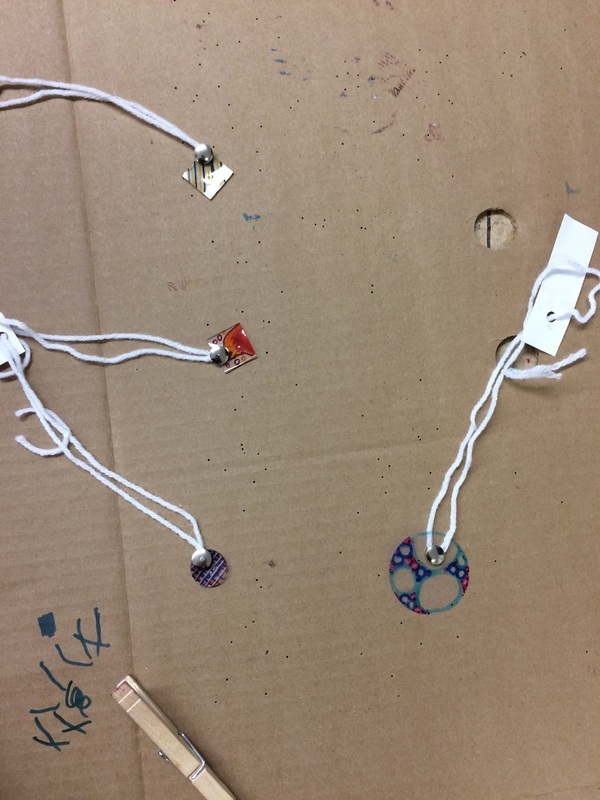 Each student was to design two shrinky dink charms either squares or circles. Using a color family of their choosing, they filled the space with a picture or design using that family. 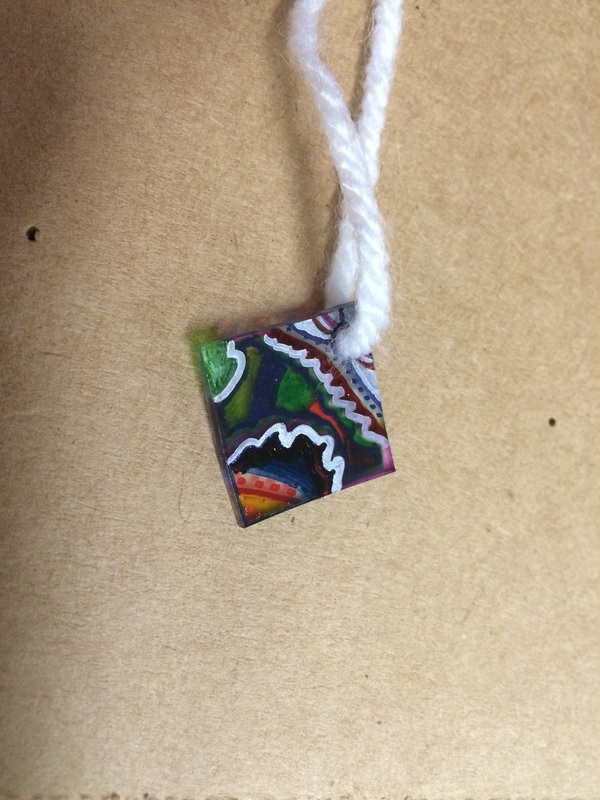 Once both sketches were done, they received their shrinky dink blanks. Using sharpie markers in their color family, they drew onto the shrinky dink plastic. 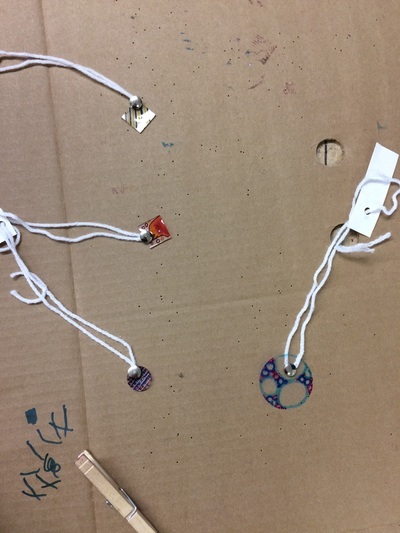 During class, I had tables come up one at a time to watch their creations get shrunk! It was very fun and the shrinking was everyone's favorite part of the project! Fifth graders learned about a Japanese art concept called a Notan. A Notan is a visual representation of the balance between light and dark. We talked about contrast and positive & negative space. 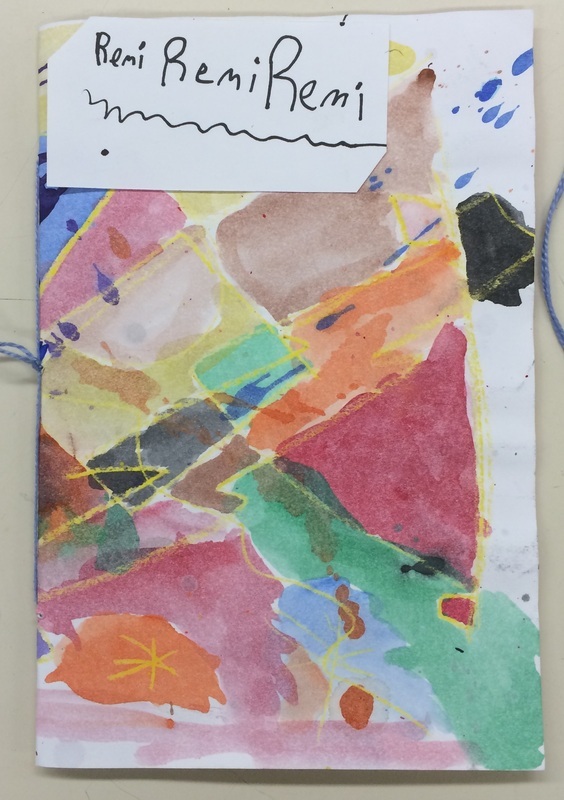 Students learned how to make their own Notan designs and created two rough drafts in their sketchbook. 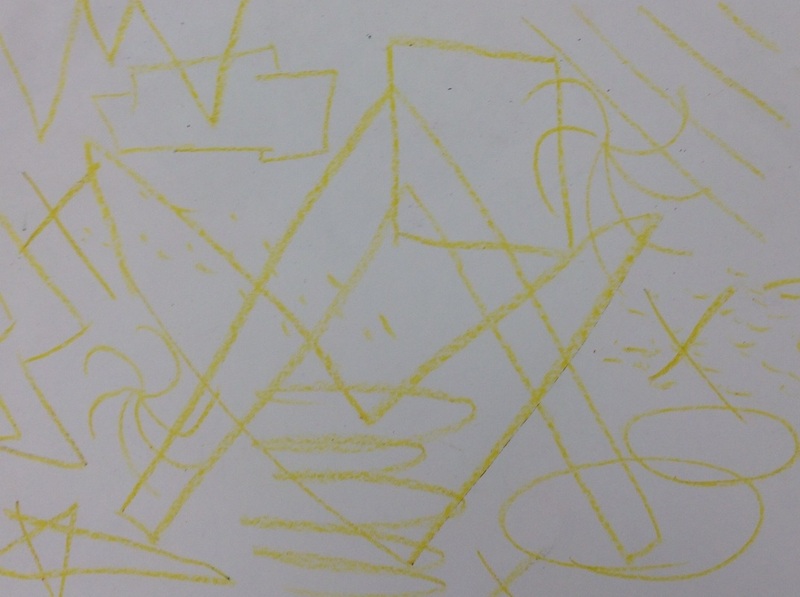 When the sketches were done, students received a piece of black paper for their final design. 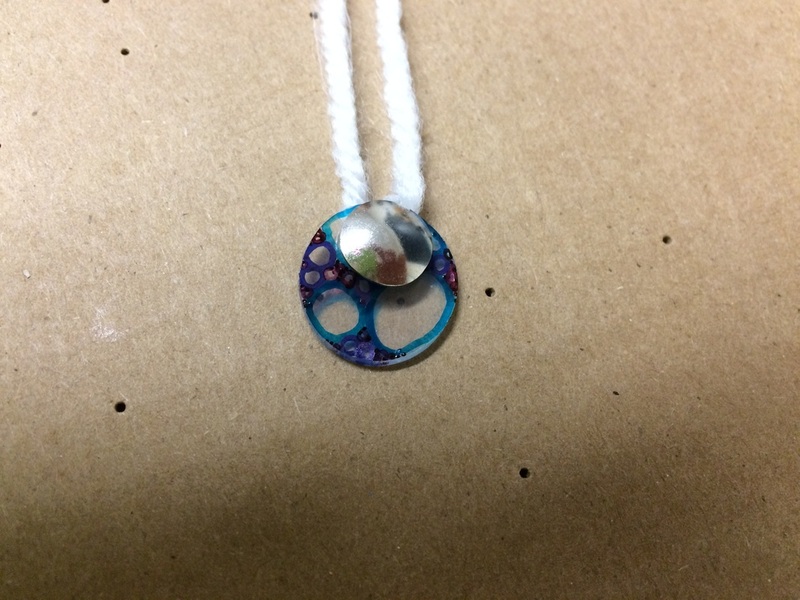 Once finished with the design, they began cutting. The third day we talked about symmetry and reflection. 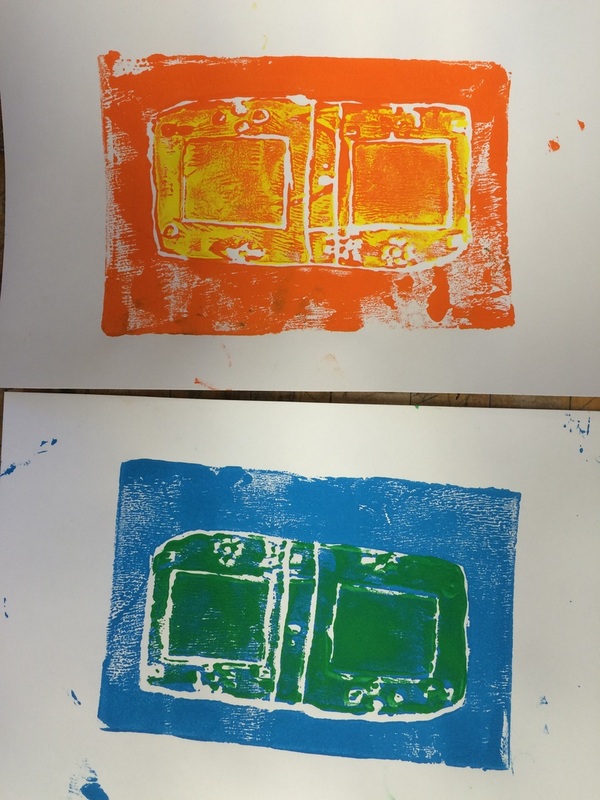 To create the contrast between positive and negative space, students reflected their pieces over the line of symmetry (edges of square). 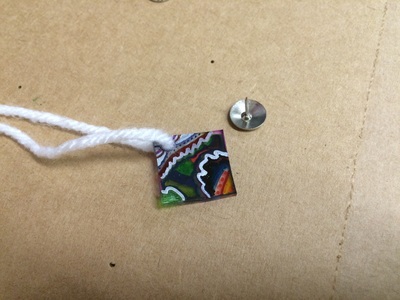 The final designs were attached to a piece of white paper. 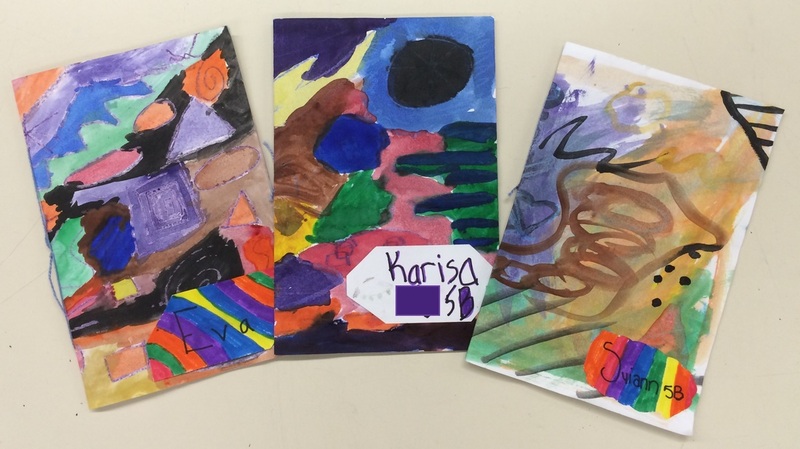 Students chose one of their watercolor paintings to use for their sketchbook cover. 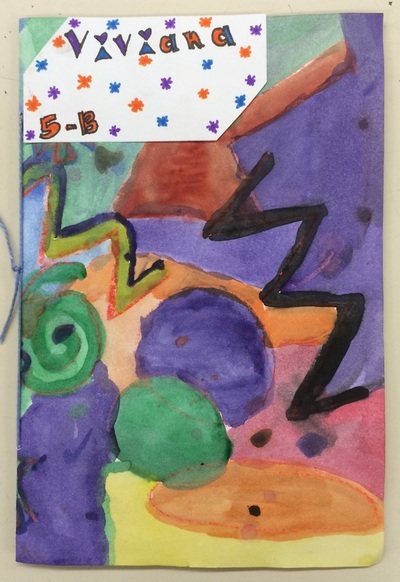 Using needle and thread, fifth graders bound pages with their painting to create a one of a kind sketchbook. 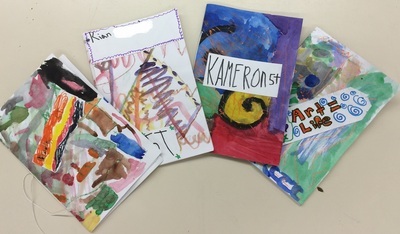 Students will use these sketchbooks for future projects to create "rough drafts" or sketches. Pictures to come! 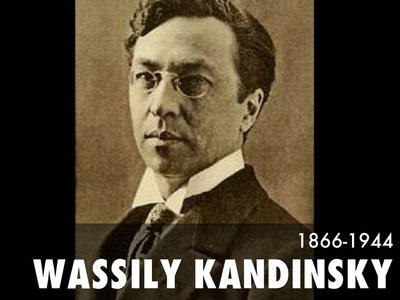 Fifth graders looked at the work of Wassily Kandinsky. 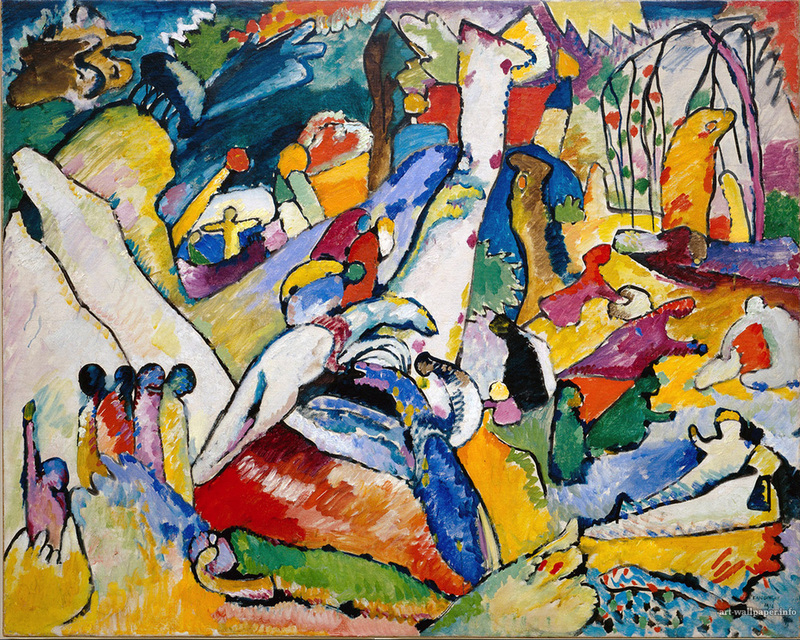 Kandinsky is considered the very first pure abstract painter. 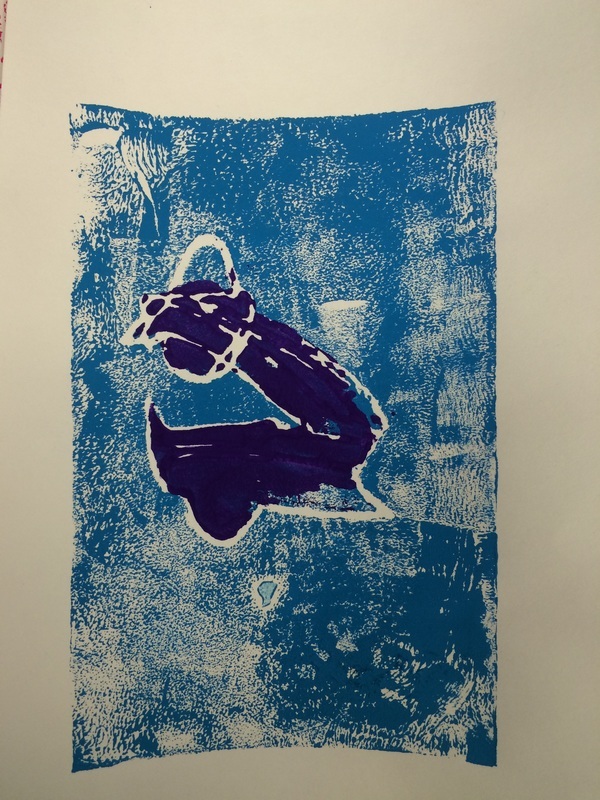 We looked at a few of his pieces over the course of his artistic career to see how he kept pushing his subject matter, creating more and more abstract images. 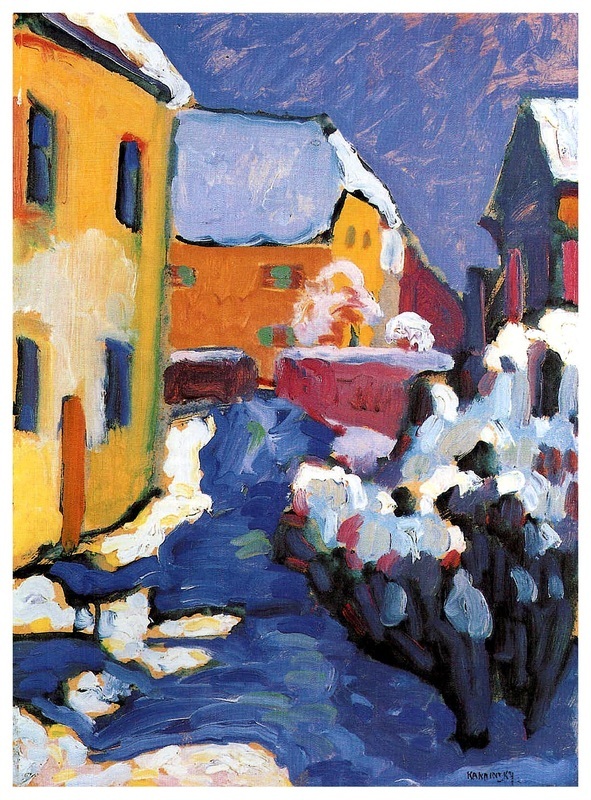 In the final image of the below gallery, Kandinsky no longer painted from what he saw, but from what he heard. 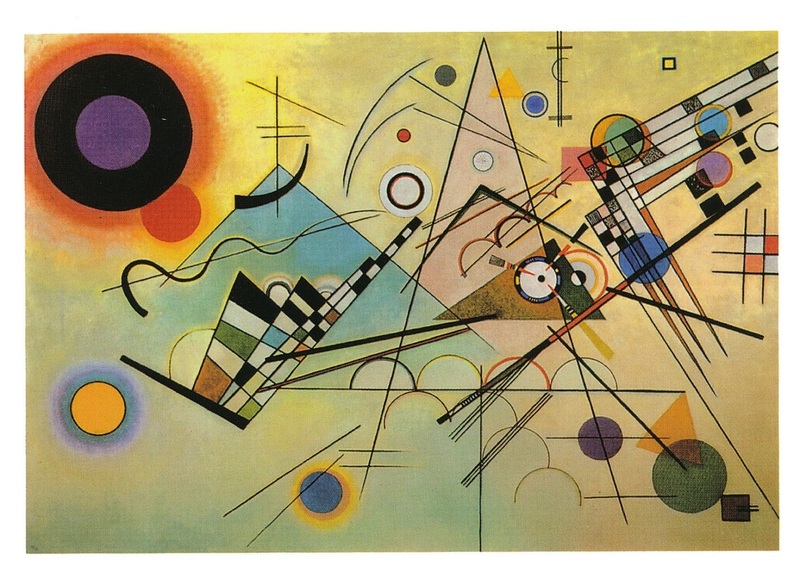 We mirrored Kandinsky's techniques and created our own pure abstract music paintings. The first day we listened to two different pieces of music. 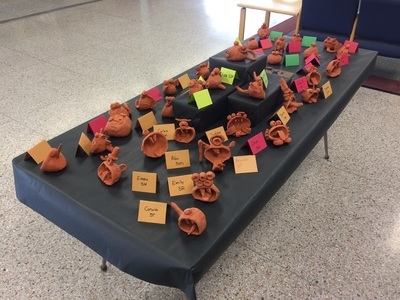 The first song was a very classic Nutcracker.The second song is a much more modern dubstep song called Stardust.The students listened for a minute with their eyes closed. 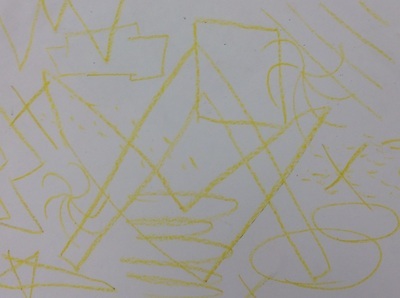 After the minute, students used crayons to recreate the mental visual of the music using simple lines and shapes in one color. The students then used watercolors to being adding color to their mental images. Students learned about wax resist and were able to see it in action first hand when they started their watercolor additions. 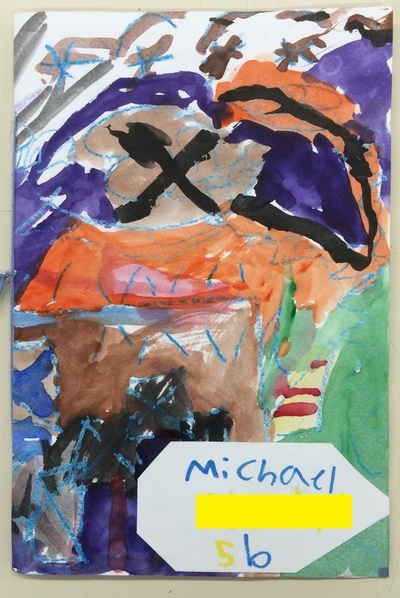 We continued to listen to the music while we worked over the course of two class periods.One painting will turn into the cover of the student's sketchbook and the other will be made ready for display.